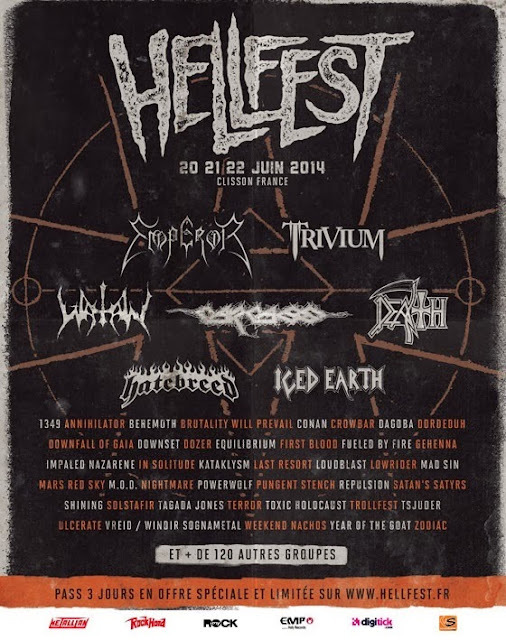 Well, here's the poster for Hellfest. Lets just say, AWESOME. Not only is their going to be over 120 bands, not only is their Emperor on their reunion tour but also the ever might Carcass! Toss in Death (which I can say from experience is a memorable live show) and Hatebreed and you have yourself something that no one is going to soon forget. Then just look down to the groups under the headliner. Yes, Repulsion, repulsion is only on the fourth line of text. THAT IS HOW GOOD THIS FESTIVAL IS. So yeah, prepare yourselves my children, Hellfest will rip your neck off.